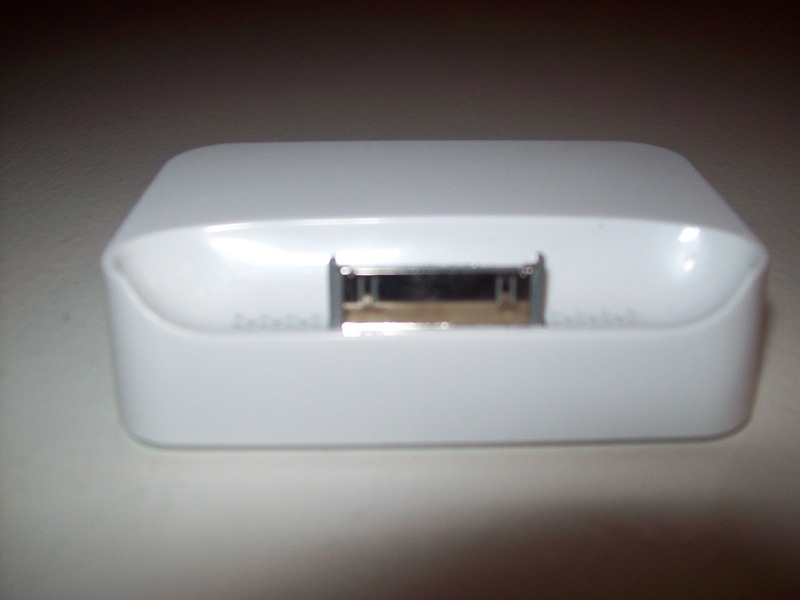 An Apple iPhone 3G/3GS or iPod Touch Cradle Dock Charger. I bid on this item and won the auction for $6.99 with free shipping. I have seen them for cheaper but some sellers I don’t really trust so do your homework. This item shipped from China and was in my mail box within and week and a half. The cradle dock if you don’t already know will charge your iPhone/iPod while positioning the device upright. This comes in handy on my nightstand so I am able to see my alarm clock and any notification I receive during the night. You will need a charging cable to plug into the device. This one didn’t come with one but some do. The charging cable is the one with a USB plug on one end and the iPhone plug on the other. I have had no issues with this item and I am very pleased with it. I used to lay my iPhone on my desk on its back so I could not see the screen and when the phone would vibrate it would rattle on the desk waking me. 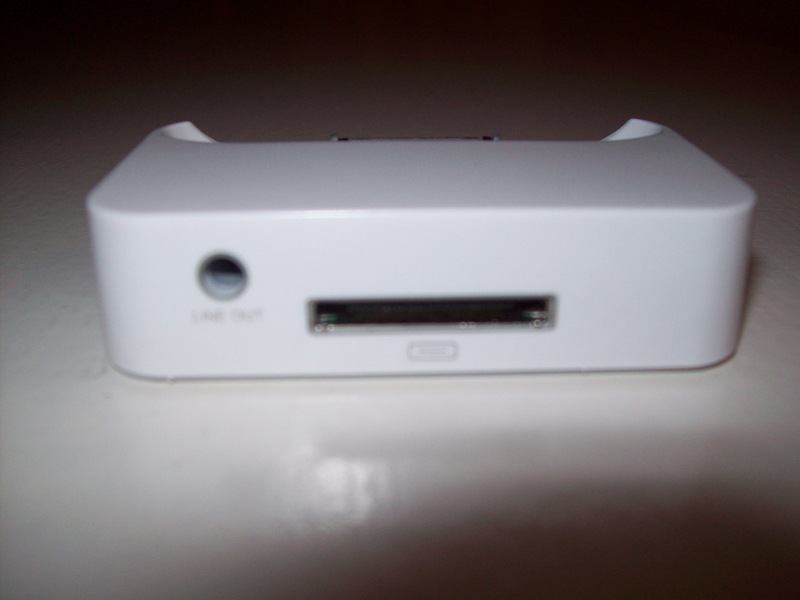 The cradle dock solved the rattle, the screen positioning and charges at the same time. Great device at a cheap price. The bonus feature is the AV jack in the back so you can play music right from the dock. I highly recommend this item if you use your phone a lot like I do. It would be great on business trips, the office or at home. This one gets a thumbs way up from me. Connect the Dock to your computer with the USB cable, then place your iPhone in the Dock to sync and charge the battery. No more reaching behind the computer to plug it in. Connect the Dock to an electrical outlet using the included Apple USB Power Adapter, then place your iPhone in the Dock to charge the battery. Connect the Dock to a stereo or speakers using an AV cable or a stereo audio cable to play music from iPhone. Place your iPhone in the Dock and enjoy clear audio during speakerphone calls thanks to special audio porting. 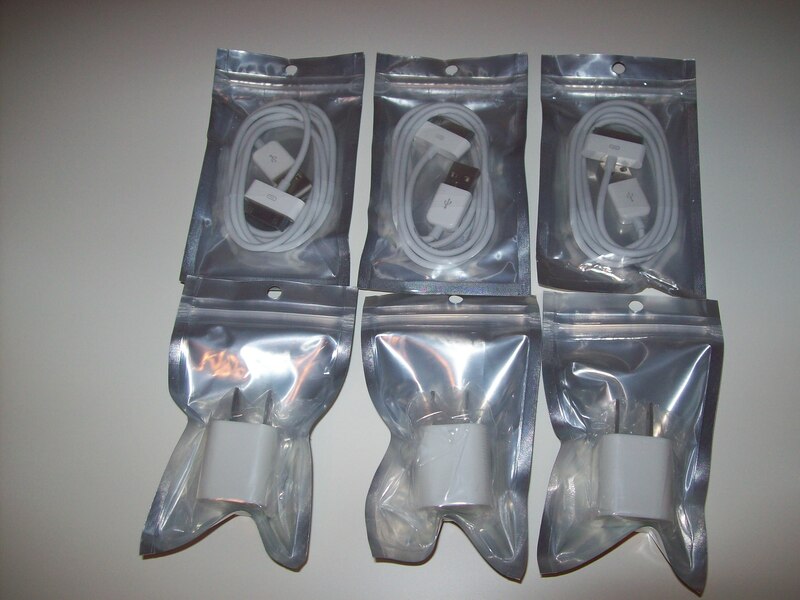 This week’s items are 3 iPhone 3GS wall charger cables and adapters. I bid on these cables from a seller in Hong Kong as a “best offer”. I talked the seller down to $12.00 plus free shipping for all three cables and adapters. *You may be able to find them for a cheaper price but I think I did well. The auction ended on April 27th and the cables arrived from Hong Kong to California today, May 7th. The items were package nicely in a bubble mailer. 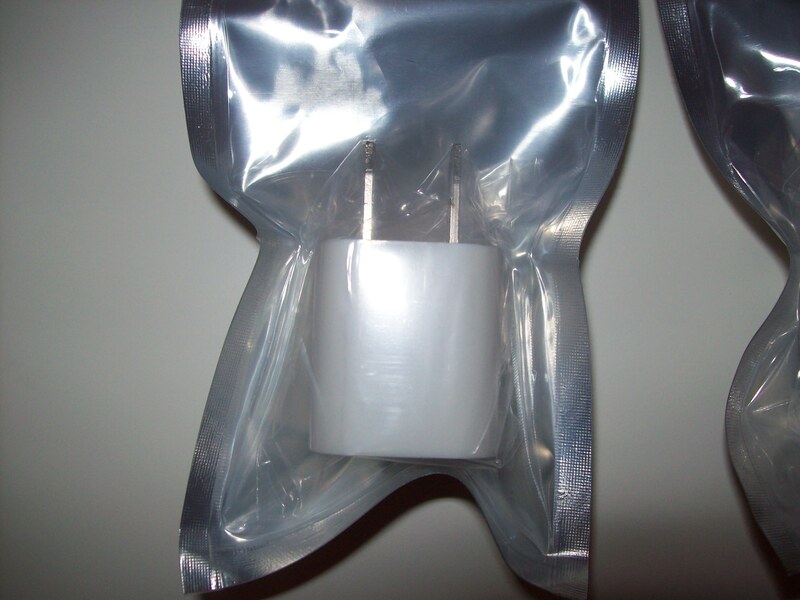 As you can see in the pictures above, the cables and adapters are individually packaged and sealed. 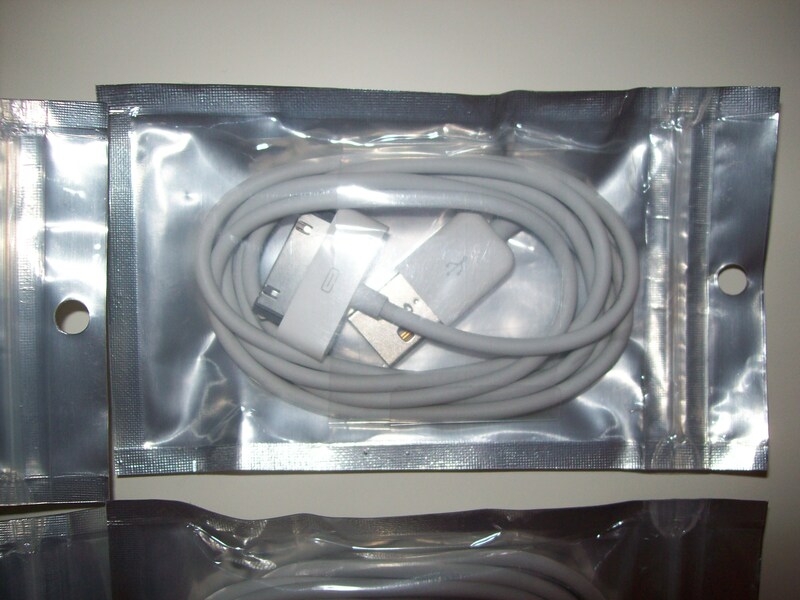 The seller stated that these were “100% new Genuine Apple iPod/ iPhone USB Sync & Charging Cables” and “Original Power Adapter Chargers”. From what I can tell they appear to be original or great fakes. They work great. On the cable there is a stamp with the words “Designed by Apple in California Assembled in China”. I am a regular eBay buyer and seller. I buy a lot of my stuff on eBay or Amazon. I have yet to have a bad transaction in over 580 transactions with eBay. I always let everyone know that if you don’t need the item that same day then you have to check out eBay. I have actually bought items for .01 cent with very low shipping. How does the seller make money on that deal? I am not affiliated with eBay in any way; I am just a guy who doesn’t like to spend $30 for something I can get for $1.99. Look for more items to come each week as I buy them for my gadgets. 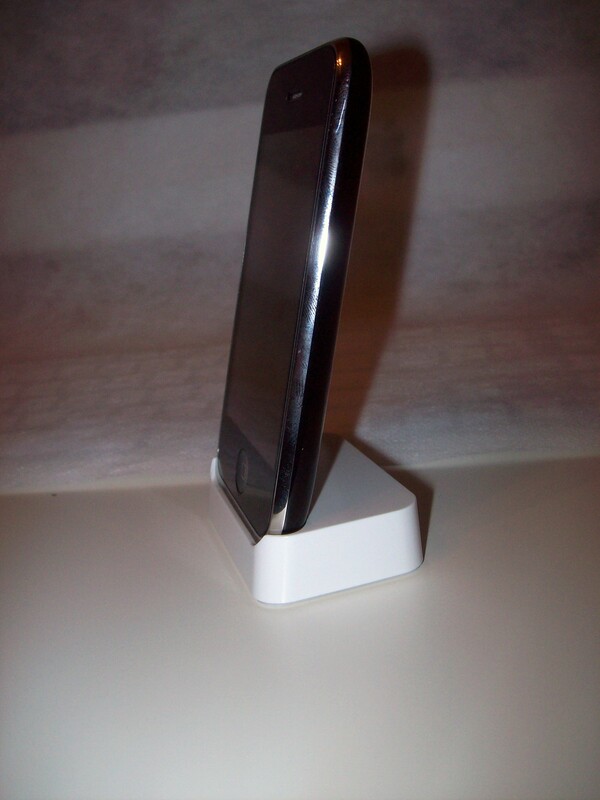 Next week I will feature an iPhone cradle dock I bought for $7.49. I will also feature soon, 2 nice looking two-tone iPhone cases…… so keep an eye out.